In 1984, Mary Lou Retton won the American Cup and went on that year to become the Olympic All Around Champion. 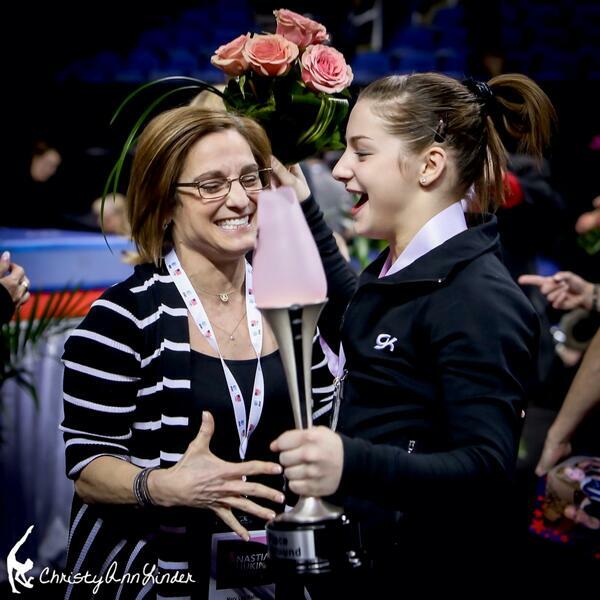 Thirty years later, her daughter McKenna Kelley tied for first at the Nastia Liukin Cup. In what had to be a sweet, sweet moment, you see Mary Lou and McKenna celebrating. Mary Lou looked much more fraught with nerves as she watched her daughter compete than she ever did as a competitor herself! She just did a live interview in the arena and did a little shriek of joy about her daughters win. She said it was so nerve racking to watch her daughter and have no control. Just for fun, let’s watch Mary Lou’s routines next to McKenna’s. Congratulations Mary Lou and McKenna!